Romney's revelations came during the taping Friday of an interview with ABC's "Live! With Kelly and Michael." The Republican nominee also fessed up to having a guilty pleasure for peanut butter sandwiches and chocolate milk. What's Romney's guilty pleasure (peanut butter sandwiches and chocolate milk). And what exactly, does the Republican presidential hopeful wear to bed? "Really? Really?" 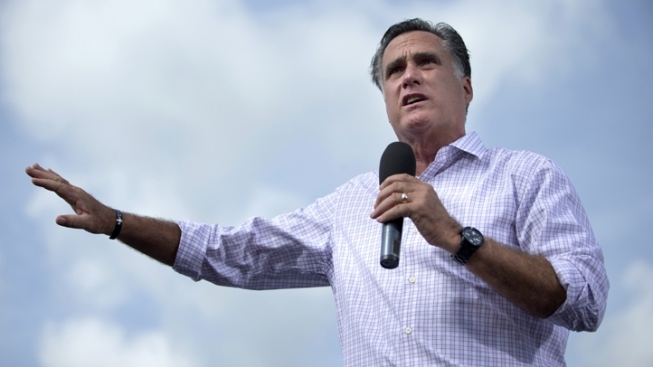 Romney said during an interview taped Friday on ABC's "Live! With Kelly and Michael." ''I think the best answer is as little as possible." Romney held hands with his wife, Ann, during a lighthearted interview that delved into topics rarely found on the Sunday talkshow circuit and gave the Republican nominee a chance to show his knowledge of pop culture. Like whether he knew much about MTV's "Jersey Shore" star Nicole "Snooki" Polizzi. "I'm kind of a Snooki fan," Romney confessed. "Look how tiny's she's gotten. She's lost weight. She's energetic. Just her spark-plug personality is kind of fun." The Romneys sat down with hosts Kelly Ripa and Michael Strahan in an interview scheduled to air Tuesday that covered more typical topics — Romney's plans for reducing unemployment and jumpstarting the economy along with his positions on gun control and health care. Asked to name something the nation doesn't know about the presidential candidate, Ann Romney said, "He's got a good heart, and I don't think people know that about him." But the chat took a fun-loving turn when Ripa and Strahan decided the Romneys should participate in a special "Romney Rapid Fire Round." ''If you think a political debate is tough, just buckle up," Ripa warned. The questions got pretty personal. Asked about a "guilty pleasure," Romney admitted to peanut butter sandwiches and chocolate milk, while Ann Romney confessed to enjoying donuts. When the questions turned to who would play Mitt in a movie, Romney said he'd like to see his "favorite actor," Gene Hackman, in the role. Romney cited Hackman's work in "The Birdcage," where he plays Kevin Keeley, a conservative senator from Ohio whose daughter wants to marry the son of a gay couple. For the role of Ann Romney, the Republican suggested actress Michelle Pfeiffer. If they could have dinner with anyone, Romney named Nelson Mandela, calling the former South African leader "a world hero." Mrs. Romney said she would have liked to have had dinner with Mother Teresa. Ann Romney recounted a visit to the White House a few years ago, when she accidentally opened a door and found President George W. Bush in the middle of a massage. "He was covered up but I was so embarrassed," Mrs. Romney said. She saw the president later in the day, and he helped defuse any awkward feelings. "He looks at me and winks, 'I look pretty good,'" she said. Strahan asked Romney to name his favorite football team, and the former Massachusetts governor was ready: "Sorry about that Mr. Giants," Romney told Strahan, a former lineman for the New York Giants. "But for me it's the New England Patriots." Both Romneys prefer iPhones to Blackberries, and Mrs. Romney finds it hard to keep up with the Kardashians. The former Massachusetts governor is a fan of ABC's "Modern Family," a pleasure shared by first lady Michelle Obama and daughters Malia and Sasha.